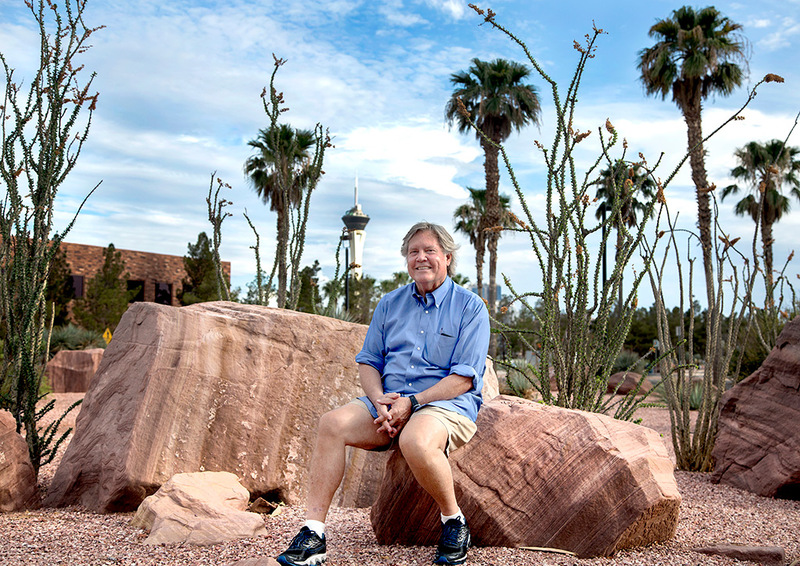 Tick Segerblom is a third generation Nevadan born in Boulder City. He represented Las Vegas in the Nevada Assembly from 2007 to 2013 and as a State Senator from 2013 to 2017, earning a reputation quickly as a staunch Progressive on issues like equal rights and marijuana legalization. Tick’s mother also served in the Nevada Assembly, and his grandmother and great grandfather were in the legislature too, making him a fourth generation Nevada state representative. Now he is running for a seat on the Clark County Commission as a Progressive Democrat concerned with quality of life in Las Vegas. In addition to working as a lawyer, for years Tick has focused on improving opportunities and services for people in Southern Nevada. He believes Clark County should plan more deliberately for the kind of metropolis it wants to be in ten years. Ensuring that economic growth coincides with investments in education and better living standards—nice parks, sustainable building, adequate law enforcement and social services, public transit and museums—are his goals. He aims to direct government to improve residents’ daily lives and consider our environmental challenges, while also nurturing new industries like tech and marijuana sales, in addition to the tourism sector. The range of projects he has worked on also reflects his interest in protecting quality of life in southern Nevada. Spearheading bills to make Nevada the gold standard for medical then recreational cannabis earned Segerblom national attention, with profiles in Vice and Quartz. Though not a frequent marijuana user himself, Tick feels strongly that including marijuana in the war on drugs was a mistake. He is a veteran of President Jimmy Carter’s campaigns and fondly remembers seeing West Wing staff smoke pot on the White House roof. For decades, marijuana has been an unnecessary criminal justice burden and a missed opportunity for state revenue; shepherding cannabis regulation into Nevada law is one of Tick’s proudest achievements. As a lawyer, Segerblom specializes in employment law, helping workers file suits for fair labor practices. Among his clients were Clark County School District teachers whose present day concerns about inadequate school funding he shares. He was recognized for his work on behalf of Nevada’s working class by the American Civil Liberties Union (ACLU) in 1992 as the “Civil Libertarian of the Year”. He received the Nevada State American Federation of Labor and Congress of Industrial Organization (AFL-CIO)’s “Friend to Nevada’s Working Families Award” in 2006. The range of projects he has worked on also reflects his interest in improving quality of life in southern Nevada. From 1991 to 1995 he was part of the Las Vegas Planning Commission, dealing with city zoning and mapping. 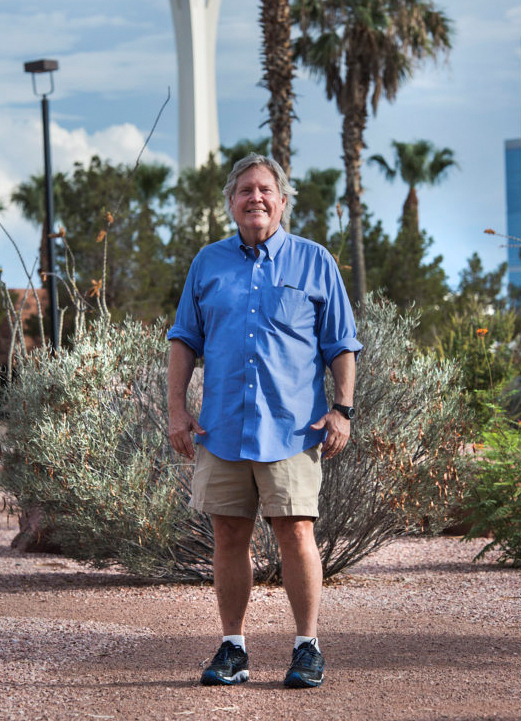 Then a member—and chair—of the Las Vegas Historic Preservation Commission, he worked to protect architecture of historical relevance from 1996 to 2000. Time and again, Tick has shown a willingness to fight big-money special interests. For example, he helped preserve important landmarks like the Las Vegas National Golf Course from development. During his tenure representing District 9 of the Nevada Assembly, and Senate District 3 after that, he also served on the Clark County Legal Aid Society board and as legal counsel to the Nevada Faculty Alliance. He worked as a rafting guide in Colorado after graduating from Pomona College in California. Whenever able, Tick likes to get out to explore Nevada’s amazing parks. He worked as a rafting guide in Colorado after graduating from Pomona College in California with a philosophy degree. And while attending the University of Denver law school he frequently returned to the Colorado River. Tick went on to serve in the White House Personnel Office for President Carter in 1977. When Segerblom returned to Nevada, he was appointed by Governor Richard Bryan to the Colorado River Commission, on which he served from 1988 until 1990. He was elected State Chair of the Nevada Democratic Party from 1990 to 1994. And in 2016 he was a vocal supporter for Bernie Sanders presidential campaign. He currently lives in Las Vegas with his wife and kids. Tick Segerblom comes from a long lineage of Nevada families who believe in the power of civil service to affect positive change in our communities. Tick’s parents, Cliff and Gene Segerblom, were longtime mainstays in southern Nevada, where they left a mark on the arts, education, and their community of Boulder City. Gene Segerblom dedicated her life to teaching and public service. A former high school teacher, Boulder City Council member, and four-term assemblywoman from 1993 – 1999, Gene inspired generations of Nevadans to take civics seriously. She was a passionate teacher of civics and government and strove tirelessly to afford her students a worldly education. One student remembered her as having only one regret in her teaching career, that the Boulder City of the mid-20th century did not offer her students the diversity — ethnic, racial, ideological, and experiential — apparent in today’s Las Vegas Valley. She was a passionate teacher of civics and government and strove tirelessly to afford her students a worldly education. Along with Gene and Tick, Tick’s grandmother and great grandfather were in the Legislature too, making Tick a fourth generation Nevada state representative. All were “Democrats to the bone,” as Tick recalls them. Gene was born March 15, 1918 in Ruby Valley in Humboldt County to a family who could count among their ancestors Pony Express riders. Her grandfather Bell owned the Buckskin Mine near Winnemucca, her mother taught in a one-room schoolhouse in Humboldt County, and her father ran the last horse-drawn stage in Ruby Valley. Along with fishing, sailing, writing, and exploring Nevada’s backcountry, she was an advocate for historic preservation and the democratic power of a well-educated citizenry. As a legislator, she was able to obtain funds for both the Boulder City Museum and the historic building it resides in, the Boulder Dam Hotel. Gene died in 2013 but lives on in the memories of the generations of southern Nevada’s children she taught and in her work to preserve the state’s heritage. “My mother bridged the old Nevada with the new, making sure she preserved the rural areas and making sure people never forgot the importance of old Nevada,” Tick said. 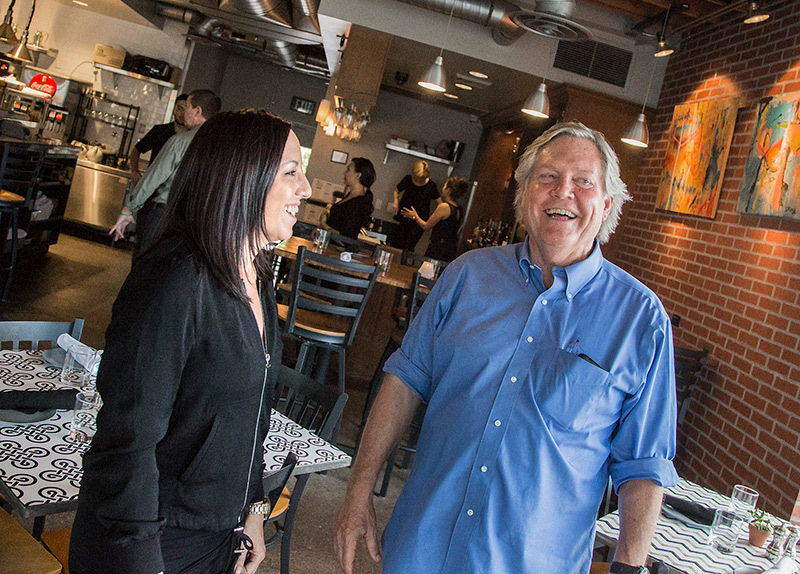 Tick’s father, Cliff Segerblom, came to Nevada at a pivotal moment in the state’s history. As a staff photographer for the Bureau of Reclamation, Cliff became the official photographer of the Boulder Canyon Project. His photos chronicled the awe-inspiring construction of Boulder Dam and the sacrifice of the thousands of workers who dedicated years of their lives to build what was then the world’s largest dam. His pictures were featured in Life, Time, National Geographic, and one of his photographs is in the Museum of Modern Art collection in New York. After the construction of the dam, Cliff divided his energies between photography and painting. He excelled in watercolor and went on to paint classic scenes of Nevada’s towns and landscapes, capturing the spirit and flavor of Nevada’s vanishing frontier. 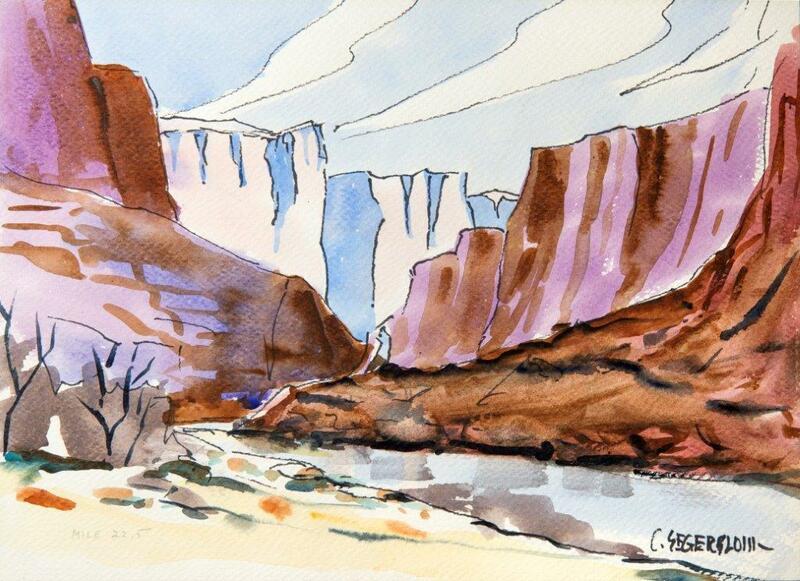 Cliff Segerblom chronicled the Southwest, sharing his passion for the land through stunning paintings of Nevada’s mining and farm towns, its canyons, rivers, mesas, and mountains. 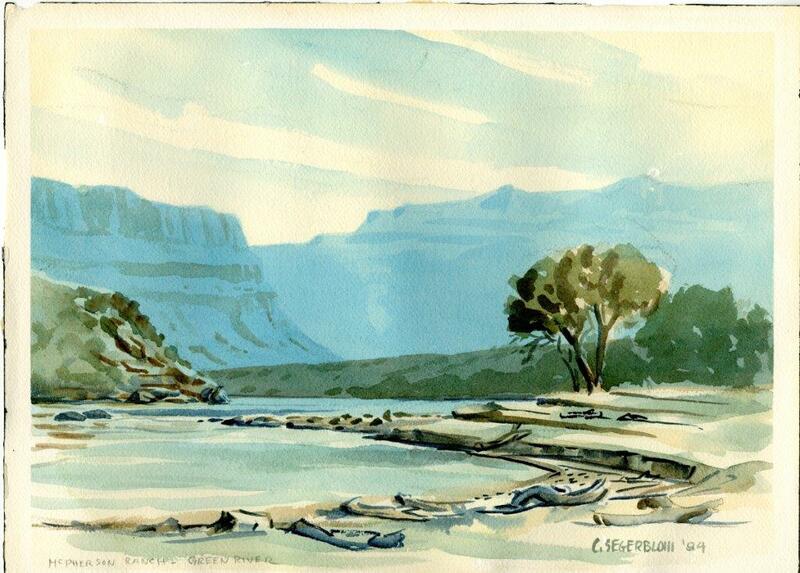 Cliff Segerblom chronicled the Southwest, sharing his passion for the land through stunning paintings of Nevada’s mining and farm towns, its canyons, rivers, mesas, and mountains. With Cliff as artist and Gene as writer, the couple’s rural Nevada travels were published in Arizona Highways, Nevada Magazine, Sunset and Family Circle. Venturing far and wide, Cliff photographed the expansion of the Panama Canal and street scenes of Guatemala. In 1969, at the invite of the Secretary of the Navy, Cliff Segerblom, documented the historic splashdown of Apollo 12, and the acrylic painting remains today among the Navy’s official art collection. When Cliff died in 1990, Gene donated his photographs and negatives to the Nevada State Museum in Las Vegas, and his legacy continues to live on in the annual Christmas cards Tick Segerblom sends to his constituents every December.